The Khmer Rouge, literally translated as Red Khmer, is the common term used for the Communist Party of Kampuchea. From the late 1960’s Cambodia became characterized by periods of instability and conflict in the wake of the war between Vietnam and the United States. After a Coup d’Etat in 1970 staged by the forces of Lon Nol backed by the United States against the then presiding head of the government former King Norodom Sihanouk, civil war ensued between the Lon Nol forces and those backing former King Sihanouk including the Khmer Rouge. On 17 April 1975 the Khmer Rouge arrived in Phnom Penh city declaring that it was the end of the civil war and renamed the State Democratic Kampuchea. People gathered in the streets cheering and welcoming the soldiers, however, the situation immediately became violent as the residents of Phnom Penh were forced out of the city en masse to the countryside. Pol Pot, “Brother No.1” of the Khmer Rouge, who sought to build an agrarian-based, classless society based on communist ideology, declared that Democratic Kampuchea would begin again at Year Zero. A centrally controlled government led by a close circle of party members took over all decision-making powers. All institutions, including, financial, educational, and religious and the family unit were abolished and private ownership, independent livelihoods, and unapproved sexual relations were outlawed. 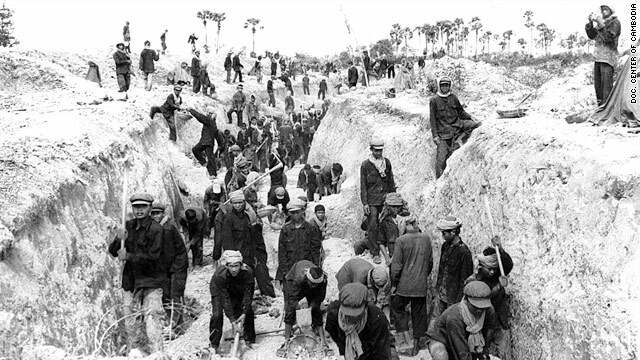 The population was put to work farming and building infrastructure to support the goals of the Khmer Rouge. This period was characterized by deprivation: deprivation of food and basic necessities; deprivation of rights, even the most basic of human rights; deprivation of rest and medical treatment; and deprivation of family and human relationships. From the arrival of the Khmer Rouge in Phnom Penh and throughout their rule anyone identified as being wealthy, educated, or connected to capitalism or previous regimes were systematically killed. Additionally, members of ethnic and religious minority groups were subjected to persecution. The population endured forced transfer; forced labor; arbitrary detention; forced marriage; and systemic violence including brutal beatings, torture, mutilation, sexual violence and executions. Live was characterized by fear of death and in a constant state of suffering. At the same time, war was waged against neighboring Vietnam. It is estimated that around 1.7 million people died from starvation, torture, execution and forced labor before the Vietnamese troops marched into Phnom Penh on 7 January 1979.